Control Neopixels With A Raspberry Pi Bluetooth LE Device #piday #raspberrypi @Raspberry_Pi « Adafruit Industries – Makers, hackers, artists, designers and engineers! Bluetooth Low Energy (aka BLE/Bluetooth 4.0/Bluetooth Smart) is the most recent incarnation of Bluetooth technology developed by the Bluetooth SIG (the organization that maintains the specification). This communication protocol is designed for applications where data needs to be transferred in small amounts at relatively low speed while consuming low amounts of power (e.g., heart rate monitor, step counter, wireless keyboard). This latest version of the protocol is not compatible with its predecessor (Bluetooth classic), as an upside, long gone are the days where pairing devices was necessary! 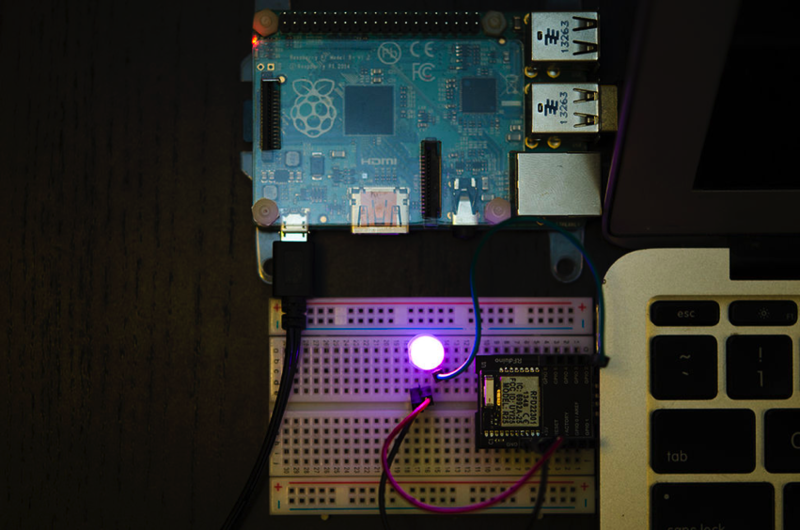 The goal of this Instructable is to demonstrate how you can setup your Raspberry Pi to control RGB LEDs from a Bluetooth Low Energy (BLE) device nearby. Specifically, we’ll be using the RFduino microcontroller, which has a built-in BLE module. We’ll easily program the microcontroller to listen to messages sent by the Pi and control the LED color accordingly.